New findings from Synergy Research Group claims AWS controls around 45% of the worldwide public IaaS market, despite the fact challengers Google and Microsoft are growing at a faster rate. While most would have assumed AWS is the number one player in the public cloud market, the size of the lead may come as a surprise. 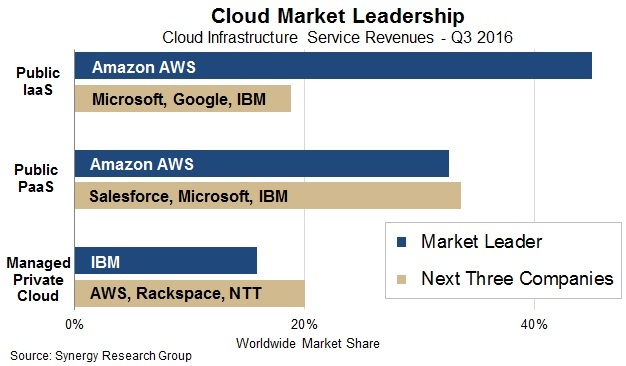 Not only does AWS now control almost half of the cloud business worldwide, this share is more than double the combined efforts of the next three players, Microsoft, Google and IBM. Over the last couple of months, the challenger companies have been very vocal on plans to crack the public cloud market and have been very complimentary about their own successes. AWS has not been as loud, instead working away quietly in the background, gathering momentum at the right time as cloud begins to penetrate the mass market. “Scale is the name of the game, especially in the public cloud markets,” said John Dinsdale, Research Director at Synergy Research Group. “Amazon, Microsoft and Google continue to invest huge amounts in their hyperscale data centre infrastructure, and all three have recently expanded their data centre footprints and also announced plans to open up more geographic regions in the coming months. While the concept of cloud computing has been around for what feels like forever, penetration in the mass market has only been in recent years. The research from Synergy highlights that it certainly isn’t slowing either. Most of the major players have now released earnings for Q3 2016 and quarterly cloud infrastructure service revenues (including public IaaS, public PaaS and managed private cloud) have now exceeded $8 billion and continue to grow at 50% year-on-year. Although AWS is the dominant market player by an extraordinary distance, the potential for future growth with offer encouragement for the challengers playing catch-up. Another area which is also encouraging is IBM’s re-rise to prominence. In the 70s and 80s, IBM or Big Blue was the dominant player in the technology world, though the evolution of the digital world saw the giant shrink into the shadows. The team has been using cloud computing as a means to launch Big Blue back into prominence, which does seem to be paying off. Alongside the promising position in the cloud rankings estimated by Synergy, the IBM Strategic Initiatives business unit, which includes cloud, analytics and engagement offerings, accounted for roughly 42% of total revenues during its third quarter. This was up from 38% in the second quarter. Total revenues may be declining with each passing quarter, though the Strategic Initiatives business unit is growing stronger and it may not be too long until fortunes are reversed for Big Blue.